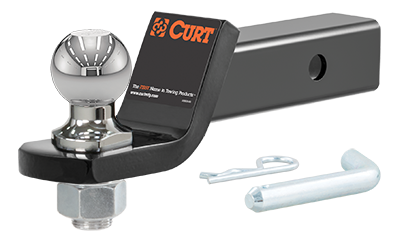 When it comes to ball mounts, a CURT loaded ball mount is the complete package. These stingers come with all necessary towing components and are pre-fitted with a factory-torqued trailer ball, eliminating the need to mount and torque your own trailer ball. This means a loaded ball mount is ready for towing right out of the package! Each one also comes with a pin and clip for mounting the ball mount into the appropriate size receiver tube.